Following the demise of importer Reco, Kioti tractors are back in Britain, with higher powered models set to appeal to a wider range of farm tasks. Jane Carley reports. 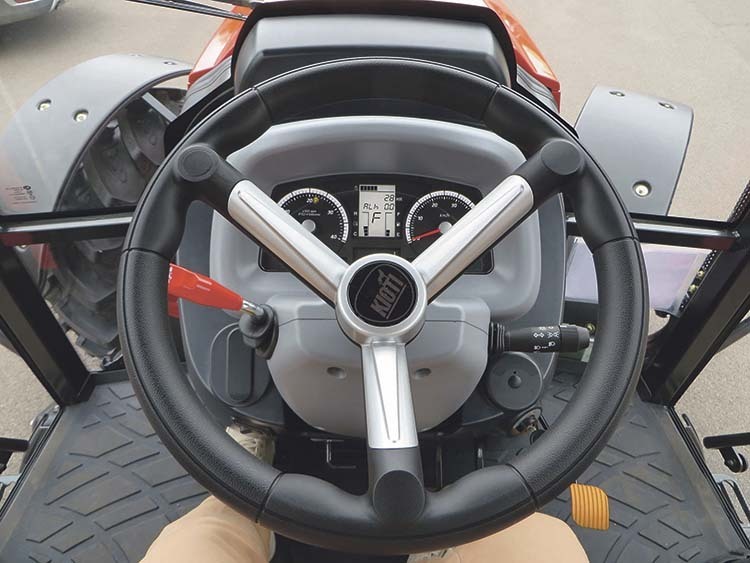 The PX series takes Kioti above 100hp for the first time. Previously imported by Reco, Kioti tractors are now once again available from a dedicated UK sales company, and a number of new models have been added to the range. This includes the 93-110hp PX series, the first time the company has broken the 100hp barrier. The Korean brand is now handled by Rotterdam-based Pols Zuidland, which also distributes Kioti tractors in France, Switzerland, Holland, Belgium and Romania. Pols has retained four former Reco employees to operate Kioti UK, headed up by General Manager Patrick Desmond, taking care of sales and service and currently based at the former Reco office in St Neots. He says; “We have 60 dealers in the UK, and with an established team in place our goal is to serve them while extending the network where possible. Tractors will be dispatched from the factory in Daegu, South Korea, to the Pols distribution centre in Holland, which also acts as the European parts hub, and takes care of pre delivery inspections before delivery direct to the dealer. A small stock of tractors for demonstrations and immediate despatch will be held at St Neots. The powershift transmission features a declutch button on the gear lever. Kioti’s range now extends from 26-110hp and includes two ranges which move Kioti on from its groundcare and smallholder roots. With its own engine, axle and transmission plants, Kioti’s parent company Daedong has been able to tailor each of the ranges to customer requirements. Flagship tractors are found in the PX series, which comprises 93, 103 and 110hp models, powered by Doosan Stage 3b, four-cylinder engines – Daedong’s production does not reach this horsepower level yet. Cab enhancements include a new digital display. A powershift transmission offers 32 by 32 speeds including creeper; a new addition is a declutch button on the gearstick. Features include a 3,600kg lift capacity, 74l/min oil flow, rear linkage control buttons on the fender, digital dash and air conditioning. 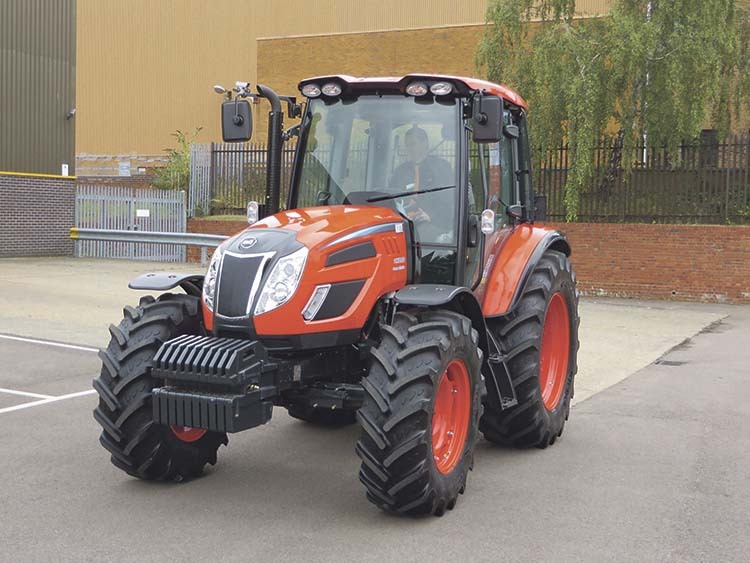 “We expect this tractor to take us more firmly into the agricultural market, and although we recognise that the 100hp bracket is competitive we think the high standard spec will be an advantage,” says Mr Desmond. The 103hp PX1053 is priced at £48,064. The 60-75hp RX series has also seen an update with the introduction of the 30-series models, which now feature a hand clutch on the gearstick, air conditioning and stereo, plus digital display. The powershuttle transmission offers 24 by 24 speeds with creeper. 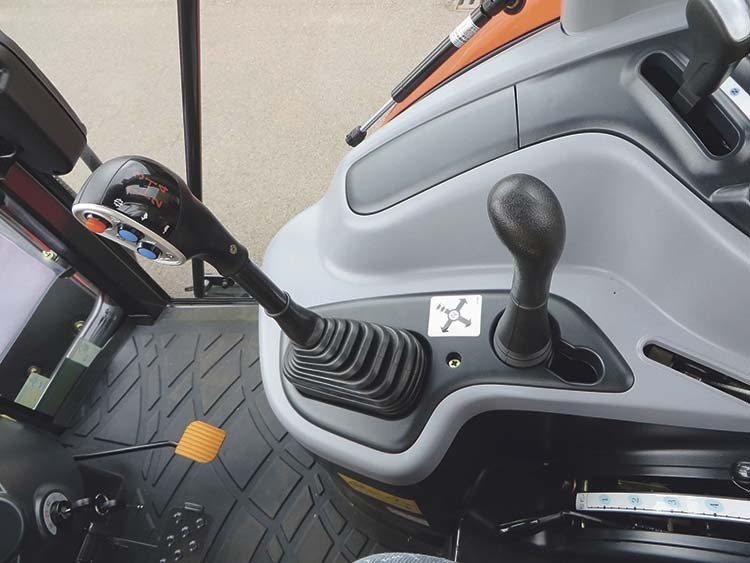 Available with ROPS or cab, Kioti UK notes growing interest in ROPS versions. With cab and powershuttle transmission the RX7330 is priced at £38,300. Popular as a scraper tractor, the EX series is replaced by NX models from 45-60hp with three or four-cylinder Daedong engines. Transmission choices comprise 24 by 24 manual shuttle, H-shuttle or three-range hydrostatic systems. Prices are from £22.250 for a 45hp ROPS versions. Kioti’s Mechron utility vehicle will now be widely available. 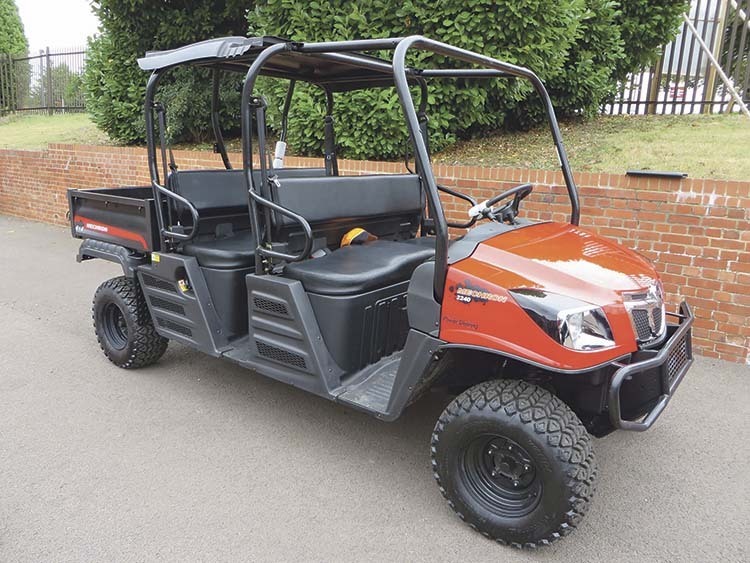 Now available throughout the dealer network, the Mechron utility vehicle has mainly found favour with the amenity market thus far. But the combination of generous ground clearance, 500kg cargo box capacity and four-wheel drive with diff lock means that it should not be out of place on farm duties. A six seater bench seat version should also appeal for use on shoots, and there is the usual choice of cabs or canopies. Founded in 1960, Pols Zuidland is a family-run machinery distribution company, which now operates separate divisions for tractors, groundcare machinery and recycling equipment from its base in Rotterdam, Holland. The company has been the Dutch importer for groundcare equipment manufacturer Ransomes Jacobsen for 35 years. Pols Zuidland operates the European distribution centre for Kioti in Rotterdam, as well as its central spare parts hub. It is also responsible for sales and service in Belgium, Switzerland, Holland, Romania and France. With 200 dealers, Kioti is now said to be the number three compact tractor brand in France.